For the past three decades, Kevin has overseen record company growth and been awarded numerous accolades on a professional front including “Executive of the Year – Medium & Large Companies” by BestinBiz International, but what he values the most is his strong passion for improving others’ lives and making a difference in the world. 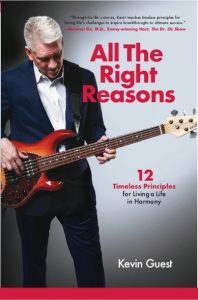 ow, in his new debut book, ‘All The Right Reasons’, Kevin outlines some of his most entertaining experiences and inspiring stories that led him to learn valuable lessons of strength and character. Some of these experiences even stem from his passion for music, as he has shared the stage with such greats as Tommy Shaw, Eddie Money, Belinda Carlisle, and Ozzy Osbourne. After reading you’ll gain insight into how Kevin became successful in business, music, and life, and you’ll be able to apply many of his lessons learned in your own life. Through his heart-warming stories of choice, sacrifice, and discovery, he explores the importance of building solid foundations, living your life for all the right reasons, and knowing your core values. The Turn Up the Volume Principle: Prepare, then fake it till you make it. The Hope Diamond Principle: Good things come to those who are prepared. The Dorothy Principle: Nothing is more important than relationships. The Butch O’Hare Principle: You have the power to change. The Plato Principle: Identify people you admire and learn the valuable lessons they have to teach you. Kevin Guest says, “When I became a grandfather, I realised I had to pass on the knowledge and wisdom I had learned to try make the world a better place”. All proceeds from the sale of the book will be donated to the USANA True Health Foundation, which provides critical food and nutrition to impoverished children and families. One book sale equals 40 meals for those who are suffering or in need. Kevin will be touring Australia on January 15th and New Zealand on January 17th to promote his book. The book is published by Inspired Solutions Publishing and is available on Amazon. RRP $32.00.